The Best in Places to Stay in Morris, Manitoba! 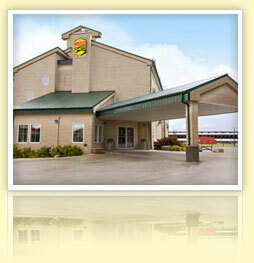 When travelling to Morris, there's simply no better place to stay than the Morris Stampede Inn. With amenities and services that are sure to please and impress, there's simply no way to go wrong! Reservations may be cancelled without charge up to two days prior to arrival. A valid credit card must be provided at the time of check-in unless you are paying with cash. If paying with cash, guests will be charged for their entire stay in advance. Final charges will be settled at the time of check-out*. *A deposit and room payment may be required if not paying by credit card. Guests bringing a pet must be willing to stay in a smoking room. A non-refundable fee of $20.00 per night plus tax is added to all rooms with pets. Pet owners agree not to leave their pet unattended at any time during their stay at the hotel. Pets are not permitted in any of the food & beverage areas. Housekeeping service will only be provided if the pet is removed from the room during the service. Pet owner will be fully responsible for any injuries to the hotel employees or other hotel guests caused by their pets. Pet owner will be fully responsible for the repair or replacement of any items stained or damaged by their pets. Guests who to choose not to register their pet and occupy a non-smoking room will be charged a $150.00 cleaning fee.